Sabbe Interior Design [the blog]: New Year . New House . New Baby! New Year . New House . New Baby! 2015, I'm so excited about you. Here is a quick mockup I did of one of the kitchen walls when doing a materials study. I keep telling Bryan that it's going to be like a modern Dowton Abby kitchen. He's like mmmkay, whatever. 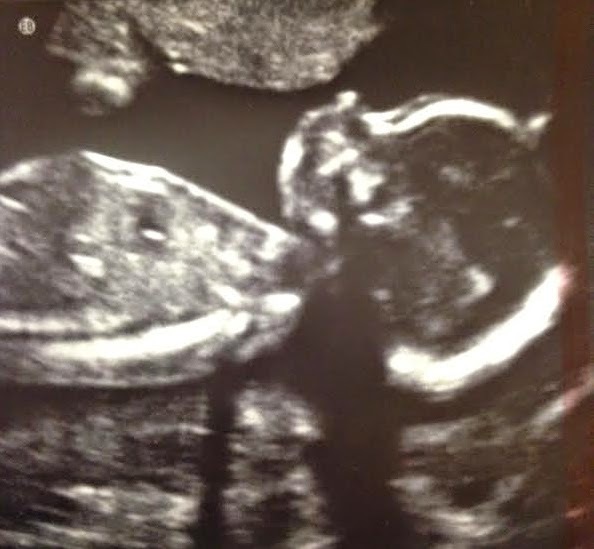 And, in other exciting news...I'm 23 weeks pregnant with a GIRL! My boys call her Strawberry Mary. Remi actually started calling her that weeks before we knew it was a girl, which is kind of crazy. He says she has red hair and red fingernails. Last week he added red eyes, also kind of crazy. But no matter what she looks like, we are so excited to welcome her into our family in May. And, more exciting news, she won't have to sleep in a closet!